The Martian south polar cap is quite small. 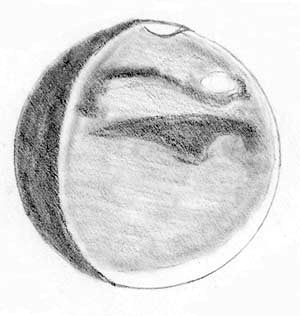 Mare Sirenum is the prominent feature visible in this sketch. To the south (up towards the south polar cap) Mare Chromium was darker than Sirenium. Lighter Eridania was a stark contrast to the darker features. Most of all she noticed the bluish north polar hood ("It was really blue!"). There was also a slight amount of evening limb haze on the preceding (terminator) limb and a brighter morning haze on the following limb. Visible without any filters. Sketch and caption by Jane Houston Jones from July 30, 2005, 4:15 a.m. PDT. The science news sites are abuzz with news of a "tenth planet" in our solar system. Much larger than previously discovered Kuiper belt objects Quaoar and Sedna, the new object, thought to be larger than Pluto, is currently designated 2003 UB313. There are rumours floating around of the discoverers giving it names like "Lila" and "Xena", but these are just temporary until the object is officially named. It's easier to say "Xena" than to say "2003 UB313." Although, come to think of it, "2003 UB313" is quite a bit easier to say than "Quaoar", so let's hope this one gets a pronounceable name so we can tell people about it easily. 2003 UB313 is currently in the constellation of Cetus, so it rises around dark and transits after midnight. At a distance of 96.6 AU, it's magnitude 18.9. That's out of visual range for most of us, but imagers should have a good chance to catch it. At perihelion it should get less 38 AU from the sun, inside Pluto's orbit. Since it's larger than Pluto, that means it should be easily visible in medium to large amateur telescopes. That's the good news. The bad news is that 2003 UB313 is near aphelion now (its most distant point from the sun), and its orbital period is nearly 560 years. So you'll have a bit of a wait. Meanwhile, Jupiter is disappearing in the evening haze. Get a look while you still can! Saturn has moved into the morning sky, but it still hasn't risen very high by the time it's lost in dawn twilight. Venus is very low in the evening sky. Check out the conjunction between it and Jupiter on the night of September 1. They'll be about a degree and a half apart, so it'll take a wide-field telescope to show them both in the same field; but it should be a beautiful naked-eye or binocular sight. If you do check it out in a telescope you'll see its gibbous shape. Jupiter is slightly gibbous too, this far past opposition, but nowhere near as obviously as Venus. Meanwhile, Mars is finally rising early enough that we can all get a look at it. Start practicing on your "Mars eyes" so you'll be ready for the opposition at the end of October! Mars is so small (even at opposition), and its colors so subtle, that it takes a lot of practice to see detail and identify features. The more practice you can get before the opposition, the easier it'll be to recognize features when Mars is close and high in the sky. Mars is moving into Taurus, which means it'll pull ever closer to Aldebaran. It's always fun to compare Mars to some of the brightest red stars - a couple of oppositions ago it passed close to Antares. Curiously, this time it'll hang out on the western edge of Taurus all through the opposition as it goes through its retrograde loop. It won't actually pass Aldebaran until March of next year. Uranus is at opposition on the last day of August, which means it's ideally placed for observing all through September. It's in Aquarius (as it has been all year) and should be easily findable with a small telescope or even binoculars, if you use a good star chart. Neptune is in Capricornus. It's a month past opposition, but don't let that stop you. First, being a little past opposition means it's higher in the sky before midnight. Second, it's in a particularly easy place to find right now, just northeast of the top middle star of the "martini glass" of Capricornus. It's only about magnitude 7.8, and there's a nice sixth magnitude star right in line with it, so if you haven't found Neptune before, try it now! And finally, Pluto. You might want to take a look at the planet which is still our smallest, but no longer our most distant. Pluto is getting tough - it's well past opposition now and sets around midnight, so if you're hunting Pluto, start as soon as the sky gets fully dark and you'll probably succeed.